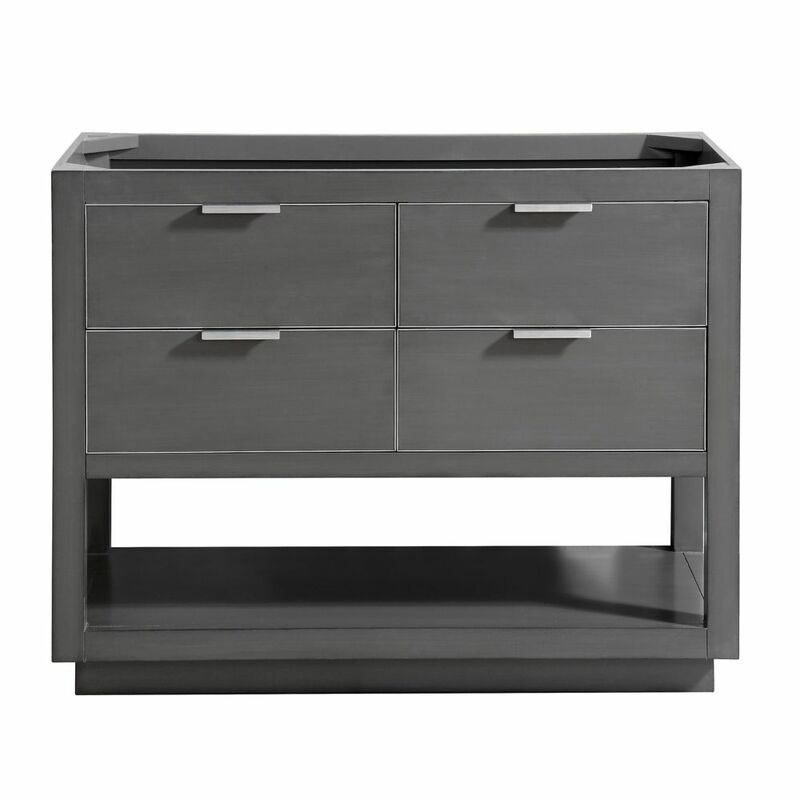 The Allie 42 inch vanity brings to you good looks and generous storage. An uncomplicated design scheme gains luster from the sophisticated Twilight Gray finish with brushed silver trim and hardware. A solid birch wood frame, plywood drawer boxes, dovetail joints, a convenient toe kick, and soft-close glides and hinges testify to the quality of construction. A large open shelf provides ample storage. Complete the look with matching mirror, mirror cabinet, and linen tower. Allie is all you need to make your bathroom amazing. Allie 42 inch Vanity Only in Twilight Gray w/ Silver Trim The Allie 42 inch vanity brings to you good looks and generous storage. An uncomplicated design scheme gains luster from the sophisticated Twilight Gray finish with brushed silver trim and hardware. A solid birch wood frame, plywood drawer boxes, dovetail joints, a convenient toe kick, and soft-close glides and hinges testify to the quality of construction. A large open shelf provides ample storage. Complete the look with matching mirror, mirror cabinet, and linen tower. Allie is all you need to make your bathroom amazing.